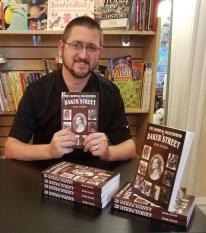 Thanks to the Jan Stauber grant from the Beacon Society, Robert Nunn was able to create a two-week unit that introduced his fifth graders to the stories of Sherlock Holmes. The unit includes his lesson plans, with objectives and pictures on pages 3-10 of the report. An assignment on identifying nouns is on page 11. Other resources used for this unit include information from Scholastic, the International Exhibition of Sherlock Holmes, and ReadingAtoZ.com. The texts used for whole class instruction are Classic Starts: The Adventures of Sherlock Holmes and On The Case With Holmes and Watson: Sherlock Holmes and the Adventure at the Copper Beeches. The scripts for the Reader’s Theater plays were The Red-Headed League and Sherlock Holmes and the Blue Carbuncle.